I wrote the following to serve as a one-page introduction, laying out some of the key items for consideration and listing some of the most accessible and reputable sources of information about climate change. For more information on specific subjects, see my climate change index. On average, the planet is warming. Most of this is because of human emissions of greenhouse gases. Continued warming would be harmful, and perhaps very risky when it comes to human welfare and prosperity. Anticipated changes include melting glaciers and polar ice, more extreme precipitation events, agricultural impacts, wildfires, heat waves, increased incidence of some infectious diseases, sea level rise, ocean acidification, and increased hurricane intensity. By most accounts, the cost of mitigation is less than the cost of adaptation. Some anticipated changes may overwhelm the capacity of human and natural systems to adapt. While there is a public perception that there is a lot of scientific disagreement about the fundamentals of climate science, this really is not the case. Back in 2004, a survey of peer-reviewed work on climate science demonstrated this. There is also a notable joint statement from the national science academies of the G8, Brazil, China, South Africa, and India. To borrow a phrase from William Whewell, there is a ‘consilience of evidence’ when it comes to the science of climate change: multiple, independent lines of evidence converging on a single coherent account. These forms of evidence are both observational (temperature records, ice core samples, etc) and theoretical (thermodynamics, atmospheric physics, etc). Together, these lines of evidence provide a conceptual and scientific backing to the theory of climate change caused by human greenhouse gas emissions that is simply absent for alternative theories, such as that there is no change or that the change is caused by something different. Readers who are dubious about the validity of mainstream climate science, or unsure of what to think, my page for waverers may be useful. There are some good primers available from reputable organizations online. 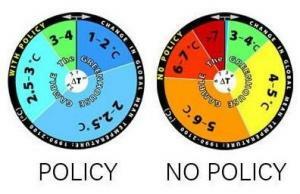 For instance, the United Kingdom’s Met Office has a quick guide. The Fourth Assessment Report of the Intergovernmental Panel on Climate Change (IPCC) is the most authoritative review of the scientific work that has been done on climate change. The summary for policy-makers for the synthesis report is available online. For detailed information on the physical science of climate change, the technical summary of the IPCC’s Working Group I report is a good resource. Unlike the summaries for policy-makers, which are vetted through a quasi-political process, the technical summaries are prepared exclusively by scientists. For Canadians who want to read one book about climate science and policy, I recommend University of Victoria Professor Andrew Weaver’s book: Keeping Our Cool: Canada in a Warming World. For those looking for a concise history of the entire development of climatic science, starting in the late 1800s, I very much recommend Spencer Weart’s The Discovery of Global Warming. In addition to the book form, it is available free online. For a more specific history of what we have learned about climate from ice core samples, see Richard Alley’s The Two Mile Time Machine. For an excellent (though somewhat technical) discussion of the relationships between the carbon cycle and biological organisms, see Oliver Morton’s Eating the Sun. Ultimately, the only way to keep the concentration of greenhouse gases in the atmosphere constant is to reach the point where humanity has zero net emissions. Getting there fundamentally requires two things: the shifting of the energy basis of the global economy to low- and then zero-carbon sources, and the stabilization of the biosphere through actions like ending net deforestation. It is widely accepted that setting a sufficiently high price for greenhouse gas emissions is a vital way to drive mitigation actions. On the costs of climate change mitigation, the most comprehensive work is probably that which has been done by Nicholas Stern, beginning with the Stern Review. The review’s executive summary is also accessible online. More recently, he has argued that the costs of inaction are even more significant than those projected at that time. On the political and ethical side of things, the best short summary may be Stephen Gardiner’s article “Ethics and Global Climate Change,” published in Ethics. Volume 114 (2004), p.555-600. One key idea related to international equity and climate change mitigation is contraction and convergence: an arrangement in which the emissions from all states eventually fall to zero, but where the per-capita emissions of developed and developing states also converge over time. My fantasy climate change policy combines a moratorium on coal and unconventional fossil fuels with a hard cap on emissions. I can recommend resources in all of these areas, if someone has a particular interest. Probably the best scientific climate change blog is RealClimate. Good responses to climate ‘skeptic’ arguments can be found in the How to Talk to a Climate Skeptic series. I also keep track of my own arguments with climate change deniers. Climate coverage in mainstream media sources is often inconsistent in quality. The BBC and The Economist often publish good information, but also sometimes include incorrect or misleading information. This ice core record of carbon dioxide concentrations illustrates one major reason why we should be more concerned about human-induced climate change than about natural variation. Our use of fossil fuels is generating a spike in greenhouse gas concentrations that is set to rise far above anything in the last 650,000 years, at least. The above shows how observed warming is inconsistent with climate models that do not incorporate human greenhouse gas emissions, but consistent with those that do. I would be delighted to answer and questions, or suggest further resources in other areas of interest. Can I suggest rewording “not all anticipated changes can be adapted to” to something like “and adaption is not possible for some of the anticipated changes”. Or if you’re really attached to the present wording then maybe add some punctuation (semi colons for the list and then a full stop) because at present it sort of looks as tough you lost part of the sentence. Re-punctuated, and re-worded. The text ‘some anticipated changes may overwhelm the capacity of human and natural systems to adapt” is very close to or identical to text from the IPCC AR4. What do you think would be the most intuitive short title to include in the navigation menu at the top of the page? Wow! what a great resource you have provided for your readers. How about “The One Stop Climate Manual” for a title? I am writing a paper on why the Kyoto protocol is failing fast, and need a good source that is current. I am using your Oxford thesis as a source too. Nobody ever expected the Kyoto Protocol to singlehandedly deal with the problem of climate change, so it is important to understand it in context. With many environmental problems, states agree to a convention, such as the United Nations Framework Convention on Climate Change (UNFCCC). These conventions are then expanded upon through protocols, such as the Kyoto Protocol. The case of ozone depleting substances is illustrative. The original treaty addressing it was the Vienna Convention for the Protection of the Ozone Layer. It was eventually made fairly effective by the ratification and implementation of the Montreal Protocol. In most cases, the Kyoto Protocol has not succeeded in curbing the growth of greenhouse gas emissions, either in developed nations that adopted hard caps or in developing states that participated through mechanisms like the Clean Development Mechanism. That said, the Kyoto Protocol was just one step on the route towards an effective international regime for climate change mitigation. The aim of the UNFCCC summit in Copenhagen this December is to try to create a successor treaty. While that may or may not happen this year, it does seem more likely than not that there will eventually be another protocol to the UNFCCC, or perhaps a new convention to replace it. The Kyoto Protocol has, at the very least, given states more experience with some of the key mechanisms that will be involved in dealing with climate change – including carbon pricing and the transfer of technologies to developing states. The worrisome thing is that we don’t have all that much time to get global emissions to level off and begin falling towards zero. Whereas the costs associated with inaction on issues like acid rain or persistent organic pollutants were moderate, those associated with climate change are potentially catastrophic. In some senses, the Kyoto Protocol has ‘failed’ insofar as it didn’t establish sufficiently effective mechanisms that states genuinely trying to cut their emissions could use. There have been problems with the carbon markets it established, for instance. At the same time, it is probably truer to say that states failed to live up to the obligations they voluntarily took on through the Kyoto Protocol, with Canada among the worst offenders. If states like Canada had accompanied ratification with a plan for actually reaching its target – and had then applied the level of effort necessary to implement that plan – the outcomes associated with the protocol as a whole would be quite different. The Kyoto treaty, even if fully implemented, would only save us about a tenth of a degree of future temperature rise many decades from now. What a waste of effort! You can see for yourself here at Junk Science’s website. There are three big problems with this claim. Firstly, this is really a red herring. The purpose of Kyoto is to establish an international mechanism for dealing with global warming by taking the first tentative steps towards a difficult goal. Political and economic mechanisms need to be worked out and agreed on. You may as well time me waking to the side walk where I parked my car () bicycle, and then tell me at this rate I will never get home. Secondly, Kyoto is a step by step process whose second phase (much less third, fourth etc.) has not even been negotiated yet, so how can anyone claim anything about how effective it is going to be? Junk Science and other sources of this propaganda are starting their dubious calculations from the assumption that Kyoto ends in 2012 when round one is over, this is just Plain Wrong. Thirdly, the temperature several decades from now is to a large extent already determined by the current energy imbalance due to the extra CO2 already in the atmosphere right now, so short of a complete cessation of emissions today, there is no foreseeable way to avoid the bulk of the warming that is “in the pipeline”. This is mostly the result of the extremely large thermal inertia of the oceans and therefore the climate system as a whole, and it means that our actions today, or our inactions, will have consequences felt several decades hence. Thank you for this one page primer. I would suggest introducing “Change” after “Climate” into whatever short title you choose. Would you like to write this presentation for me? Thanks for the tips. I need to find more info about China as I plan to use Canada and China as examples. I have lots of detail about Canada. How do I site your thesis and your blog? David MacKay, whose excellent book I reviewed before, has been appointed Chief Scientific Advisor of the Department of Energy and Climate Change in the United Kingdom and given a staff of 50. Too long for the navigation menu. I would prefer something shorter than ‘climate in one page,’ actually. This entire post has been copied verbatim (with hotlinked images, to boot) over at World Changing Canada. While that is consistent with my copyright policy, it does seem a touch excessive. A short explanation of the greenhouse effect might be a good thing to include. RealClimate has a good ‘start here’ page. If you think climate change is something for the next generation, think again. In a detailed study of trends in UK ecosystems, researchers have found that not only has the environment changed, but everything from butterflies and beetles to soil, is responding. Researchers measured differences in climate, air pollution, soil chemistry, plant abundance and type, and the numbers and spread of butterflies, moths, bats and beetles across 12 sites in the UK between 1993 and 2007. Reported in the journal Biological Conservation, it’s the most detailed study of UK ecosystems to date. ‘Nowhere else in the world has anyone looked at such a large range of different factors and brought them all together,’ says Dr Mike Morecroft of Natural England, who led the study. The scientists show that temperatures have risen faster than the global average and rainfall has increased over the period 1993 to 2007 at the 12 sites. But the acidity of rain has dropped dramatically, as a direct result of a clampdown on sulphur emissions since the 1970s, leading to less acid soils at some sites. The strongest evidence yet that the rise in atmospheric CO2 emissions continues to outstrip the ability of the world’s natural ‘sinks’ to absorb carbon is published this week in the journal Nature Geoscience. An international team of researchers under the umbrella of the Global Carbon Project reports that over the last 50 years the average fraction of global CO2 emissions that remained in the atmosphere each year was around 43 per cent – the rest was absorbed by the Earth’s carbon sinks on land and in the oceans. During this time this fraction has likely increased from 40 per cent to 45 per cent, suggesting a decrease in the efficiency of the natural sinks. The team brings evidence that the sinks are responding to climate change and variability. The scientists report a 29 per cent increase in global CO2 emissions from fossil fuel between 2000 and 2008 (the latest year for which figures are available), and that in spite of the global economic downturn emissions increased by 2 per cent during 2008. The use of coal as a fuel has now surpassed oil and developing countries now emit more greenhouse gases than developed countries – with a quarter of their growth in emissions accounted for by increased trade with the West. “The greenhouse effect, by which gases such as carbon dioxide absorb heat, setting up a warming blanket around the world, was first postulated by the French mathematician and physicist Joseph Fourier in 1824. Fourier understood that solar energy heated the Earth, which then reflected that heat back into space in the form of infrared radiation. In effect, the sun’s heat bounced off the Earth’s surface. In the 1850s the Irish physicist John Tyndall figured out a way to actually test and measure the capacity of various gases, including nitrogen, oxygen, water vapour, carbon dioxide, and ozone, to absorb and transmit radiant energy. By 1858 he had effectively proved Fourier’s theory. Given the dated nature of the last report of the Intergovernmental Panel on Climate Change (IPCC), a panel of some of the world’s most respected climate scientists have put together an update called The Copenhagen Diagnosis. The news is worse than predicted on every front. Global carbon dioxide emissions are up 40 per cent from 1990. The global warming trend has continued, despite a temporary decline in solar energy. Both Greenland and Antarctic ice-sheets are losing mass at an accelerating rates, as are glaciers the world over. Summer-time melting of Arctic sea-ice during 2007-2009 was about 40% greater than the average prediction from the IPCC’s last report. Global average sea-level has risen at a rate 80% above past IPCC predictions over the past 15 years. Several vulnerable elements in the climate system (e.g. continental ice-sheets. Amazon rainforest, West African monsoon and others) could pass irreversible tipping points if warming continues in a business-as-usual way throughout this century. Two new books will help kids, and perhaps their adults, understand what is happening and what they can do to help. Our Choice: How We Can Solve the Climate Crisis (Young Readers Edition), by Al Gore, is a version of an adult book adapted for youngsters. A follow-up to his famous An Inconvenient Truth, this book departs from Gore’s previous one by emphasizing actions we can take and the hope we can hold on to. We Are the Weather Makers: The History of Climate Change, by Tim Flannery, is aimed at middle schoolers and high school students, and makes an excellent introduction to the topic for young readers. Its pages cover a range of topics, sometimes technical, including the planet’s carbon cycle, fossil fuels, greenhouse gases and sea-level rise, among others. It’s a scary and confusing world out there, and kids know it. Turning to some experts for a little child-friendly help is one of the best ways to put fears to rest and to talk about how to face those that can’t be put away. Do you know any other good climate change resources for kids? Our climate has tipping points. Collectively, this is one way to argue that humanity’s big experiment with boosting the concentration of greenhouse gasses (GHGs) in the atmosphere is dangerous. The records we have on the history of the climate suggest it can be changed quickly and dramatically. As we continue to emit GHGs, we are pushing towards whichever of those tipping points are closest. The world’s top climate scientists agree that human activities are forcing climate change at an extraordinary rate — with disastrous consequences if we fail to change course. In July 2009, Prime Minister Stephen Harper signed on to a G8 summit declaration recognizing the broad scientific view that the increase in global average temperature above pre-industrial levels ought not to exceed 2°C. The question is no longer whether the climate is changing, but how long we have to act before those changes become irreversible. The following resources summarize the most up-to-date and authoritative climate research. 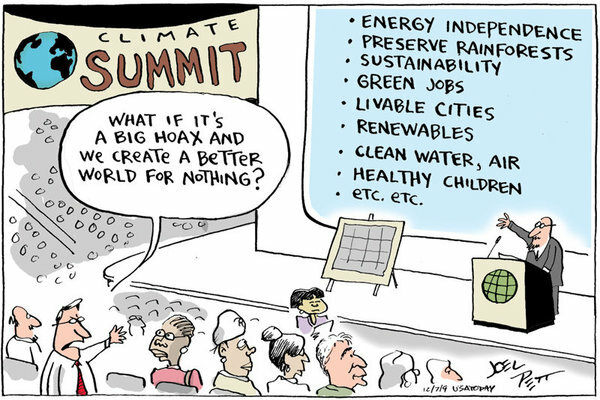 For someone concerned about climate change, what would you suggest they do? Lobby your political representatives. Individual action will never be enough to deal with this problem. Do what you can to debunk misleading arguments repeated by climate change deniers. Eat less meat (ideally none). Fly less (ideally not at all). Read some good books – like George Monbiot’s Heat or David MacKay’s Sustainable Energy – Without the Hot Air and take actions that seem like appropriate responses for you. Oh, and please keep contributing to discussions here. What about something to combat deforestation? “The study, carried out by 12 research groups, showed – for the first time – an acceleration in seasonal timings (phenology) at an environment-wide scale. Previous studies had identified the trend of spring arriving earlier, but had focused on single species or a small grouping, generally plants. “We have shown that the acceleration is an average pattern across the terrestrial, marine and freshwater environments,” Dr Thackeray told BBC News. For those who prefer video to text: Peter Sinclair’s video on the evidence for man-made global warming. A review from the UK Met Office says it is becoming clearer that human activities are causing climate change. It says the evidence is stronger now than when the Intergovernmental Panel on Climate Change carried out its last assessment in 2007. The analysis, published in the Wiley Interdisciplinary Reviews Climate Change Journal, has assessed 110 research papers on the subject. It says the Earth is changing rapidly, probably because of greenhouse gases. In 2007 the IPCC’s report concluded that there was “unequivocal” evidence that the Earth was warming and it was likely that it was due to burning of fossil fuels. Since then the evidence that human activities are responsible for a rise in temperatures has increased, according to this new assessment by Dr Peter Stott and colleagues at the UK Met Office. The Met Office study comes at a time when some have questioned the entire basis of climate science following recent controversies over the handling of research findings by the IPCC and the Climate Research Unit at the University of East Anglia. Dr Stott denies that the study has been published as part of a fight back by the climate research community. The study, which looks at research published since the IPCC’s report, has found that changes in Arctic sea ice, atmospheric moisture, saltiness of parts of the Atlantic Ocean and temperature changes in the Antarctic are consistent with human influence on our climate. “What this study shows is that the evidence has strengthened for human influence on climate and we know that because we’ve looked at evidence across the climate system and what this shows very clearly is a consistent picture of a warming world,” said Dr Stott. “Every piece of valid evidence — long-term temperature averages that smooth out year-to-year fluctuations, Arctic sea ice volume, melting of glaciers, the ratio of record highs to record lows — points to a continuing, and quite possibly accelerating, rise in global temperatures. A new climate change report from the Met Office and its US equivalent has provided the “greatest evidence we have ever had” that the world is warming. Usually scientists rely on the temperature over land, taken from weather stations around the world for the last 150 years, to show global warming. But climate change sceptics questioned the evidence, especially in the wake of recent scandals like “climategate”. Now for the first time, a report has brought together all the different ways of measuring changes in the climate. The ten indicators of climate change include measurements of sea level rise taken from ships, the temperature of the upper atmosphere taken from weather balloons and field surveys of melting glaciers. New technology also means it is possible to measure the temperature of the oceans, which absorb 90 per cent of the world’s heat. The State of the Climate report shows “unequivocally that the world is warming and has been for more than three decades”. And despite the cold winter in Europe and north east America, this year is set to be the hottest on record. Right on the first page, the Jasons predicted that carbon dioxide levels in the atmosphere would double from their preindustrial levels by about 2035. Today it’s expected this will happen by about 2050. They suggested that this doubling of carbon dioxide would lead to an average warming across the planet of 2-3C. Again, that’s smack in the middle of today’s predictions. They warned that polar regions would warm by much more than the average, perhaps by as much as 10C or 12C. That prediction is already coming true – last year the Arctic sea ice melted to a new record low. This year may well set another record. Under the chairmanship of Jule Charney, a National Academy of Sciences study produced a comparable estimate for climate sensitivity. See: National Academy of Sciences, Climate Research Board (1979). Carbon Dioxide and Climate: A Scientific Assessment (Jule Charney, Chair). Washington, DC: National Academy of Sciences. Prof. Richard Muller of Berkeley, a physicist who has gotten into the climate skeptic game, has been leading the Berkeley Earth Surface Temperature project, an effort partially financed by none other than the Koch foundation. And climate deniers — who claim that researchers at NASA and other groups analyzing climate trends have massaged and distorted the data — had been hoping that the Berkeley project would conclude that global warming is a myth. The deniers’ response was both predictable and revealing; more on that shortly. But first, let’s talk a bit more about that list of witnesses, which raised the same question I and others have had about a number of committee hearings held since the G.O.P. retook control of the House — namely, where do they find these people? We haven’t gone nuts — but the “conversation of democracy” has become so deeply dysfunctional that our ability to make intelligent collective decisions has been seriously impaired. Throughout American history, we relied on the vibrancy of our public square — and the quality of our democratic discourse — to make better decisions than most nations in the history of the world. But we are now routinely making really bad decisions that completely ignore the best available evidence of what is true and what is false. When the distinction between truth and falsehood is systematically attacked without shame or consequence — when a great nation makes crucially important decisions on the basis of completely false information that is no longer adequately filtered through the fact-checking function of a healthy and honest public discussion — the public interest is severely damaged. That is exactly what is happening with U.S. decisions regarding the climate crisis. The best available evidence demonstrates beyond any reasonable doubt that the reckless spewing of global-warming pollution in obscene quantities into the atmospheric commons is having exactly the consequences long predicted by scientists who have analyzed the known facts according to the laws of physics. Schmidt,G.A., Ruedy,R.A., Miller, R.L. and Lacis,A.A. 2010. Attribution of the present day total greenhouse effect. JGR 115, D20106, doi:10.1029/2010JD014287, 2010; Lacis,A.A., Schmidt,G.A., Rind,D. and Ruedy, R.A. 2010. Atmospheric CO2: Principal control knob governing Earth’s temperature. Science 330:356-359. Two recent studies confirm that while only 25 percent of the Earth’s planetary greenhouse effect is caused by the presence of long lived greenhouse gases (particularly CO2), the natural greenhouse effect would collapse without these gases. Furthermore, CO2 concentrations are the primary control for the magnitude of this effect. Public discussions about the natural greenhouse effect and climate sensitivity to rising CO2 concentrations often indicate a misunderstanding of the roles of long lived greenhouse gases (LLGHGs) relative to those of water vapour and cloud feedbacks within the climate system. Two new studies undertaken by scientists at the NASA Goddard Institute for Space Studies have provided some updated estimates for these roles and reinforce the central role of LLGHGs in the greenhouse effect. In one of these, a team of scientists led by Gavin Schmidt undertake a review of related scientific literature and use the radiation component of their GISS global climate model to examine the role of each of the key components of the greenhouse effect for current and 2xCO2 conditions. They find that for current conditions, water vapour represents 50% of the effect, clouds 25% and CO2 20%. The remaining five percent is due to the minor roles played by other radiation absorbers. While the total effect increases significantly under doubled CO2 conditions, the ratios essentially remain the same. The second study, led by Andrew Lacis, emphasizes the importance of the initial radiative forcing caused by CO2 and the other minor LLGHGs in sustaining the natural greenhouse effect and in causing changes in its magnitude. They show that, without this initial forcing, the greenhouse effect would collapse, leaving the Earth a frozen planet. Increases in CO2 are also the primary driver of enhanced greenhouse effects and the resulting rise in surface temperatures. That is, while the roles of water vapour and cloud effects are very important in the net greenhouse effect, they function as feedbacks rather than primary drivers of change. The past is the key to the future. Contrary to popular belief, climate models are not the principal basis for assessing human-made climate effects. Our most precise knowledge comes from Earth’s paleoclimate, its ancient climate, and how it responded to past changes of climate forcings, including atmospheric composition. Our second essential source of information is provided by global observations today, especially satellite observations. which reveal how the climate system is responding to rapid human-made changes of atmospheric composition, especially atmospheric carbon dioxide (CO2). Models help us interpret past and present climate changes, and, in so far as they succeed in simulating past changes, they provide a tool to help evaluate the impacts of alternative policies that affect climate. Paleoclimate data yield our best assessment of climate sensitivity, which is the eventual global temperature change in response to a specified climate forcing. A climate forcing is an imposed change of Earth’s energy balance, as may be caused, for example, by a change of the sun’s brightness or a human-made change of atmospheric CO2. For convenience scientists often consider a standard forcing, doubled atmospheric CO2, because that is a level of forcing that humans will impose this century if fossil fuel use continues unabated. We show from paleoclimate data that the eventual global warming due to doubled CO2 will be about 3°C (5.4°F) when only so-called fast feedbacks have responded to the forcing. Fast feedbacks are changes of quantities such as atmospheric water vapor and clouds, which change as climate changes, thus amplifying or diminishing climate change. Fast feedbacks come into play as global temperature changes, so their full effect is delayed several centuries by the thermal inertia of the ocean, which slows full climate response. However, about half of the fast-feedback climate response is expected to occur within a few decades. Climate response time is one of the important ‘details’ that climate models help to elucidate. A three-year-long pole-to-pole series survey to collect data on greenhouse gas will end on Friday, say U.S. scientists. The survey, is known as HIPPO, comprised several pole-to-pole research flights that successfully collected atmospheric gases in three years and generated the first-ever detailed mapping of gases and particles that affect Earth’s climate, they say. FOR those who question whether global warming is really happening, it is necessary to believe that the instrumental temperature record is wrong. That is a bit easier than you might think. There are three compilations of mean global temperatures, each one based on readings from thousands of thermometers, kept in weather stations and aboard ships, going back over 150 years. Two are American, provided by NASA and the National Oceanic and Atmospheric Administration (NOAA), one is a collaboration between Britain’s Met Office and the University of East Anglia’s Climate Research Unit (known as Hadley CRU). And all suggest a similar pattern of warming: amounting to about 0.9°C over land in the past half century. To most scientists, that is consistent with the manifold other indicators of warming—rising sea-levels, melting glaciers, warmer ocean depths and so forth—and convincing. Yet the consistency among the three compilations masks large uncertainties in the raw data on which they are based. Hence the doubts, husbanded by many eager sceptics, about their accuracy. A new study, however, provides further evidence that the numbers are probably about right. At the mid-range of IPCC climate sensitivity, a trillion tonnes cumulative carbon gives you about 2C global mean warming above the pre-industrial temperature. This sort of thing has happened before: a few people who have some degree of technical knowledge, but who are not climate scientists, publish a letter denying the seriousness of climate change in a sympathetic publication. Let’s consider for a moment which groups have expressed their concern about climate change. Above, I link a joint statement from the national science academies of the G8, Brazil, China, and India. Let’s also look at what the planet is telling us. Arctic sea ice continues to decline, global temperatures continue to rise, the atmospheric concentration of CO2 continues to increase, and the world continues to burn fossil fuels at a frightening pace. I don’t think the letter you cite is any cause for diminished concern about climate change. The graphic is from here. The Wall Street Journal has received a dressing down from a large group of leading scientists for promoting retrograde and out-of-date views on climate change. In an opinion piece run by the Journal on Wednesday, nearly 40 scientists, including acknowledged climate change experts, took on the paper for publishing an article disputing the evidence on global warming. “Do you consult your dentist on your heart condition? In science, as in any area, reputations are based on knowledge and expertise in a field, and on published, peer-reviewed work. If you need surgery, you want a highly experienced expert in the field who has done a large number of the proposed operations,” the article said. The scientists went on: “On 27 January, the Wall Street Journal published an op-ed on climate change by the climate science equivalent of dentists practicing cardiology. While accomplished in their own fields, most of these authors have no expertise in climate science. The few authors who have such expertise are known to have extreme views that are out of step with nearly every other climate expert. Sources: Canadian Association of Petroleum Producers; Royal Society of Canada Expert Panel on Environmental and Health Effects of Canada’s Oil Sands Industry (December 2010); Energy Resources Conservation Board; Alberta Energy; National Pollution Release Inventory. OTTAWA — Two Canadian climate change scientists from the University of Victoria say the public reaction to their recently published commentary has missed their key message: that all forms of fossil fuels, including the oilsands and coal, must be regulated for the world to avoid dangerous global warming. The commentary, published in the British scientific journal, Nature Climate Change, estimated the impact of consuming the fuel from oilsands deposits — without factoring in greenhouse gas emissions associated with extraction and production — would be far less harmful to the planet’s atmosphere than consuming all of the world’s coal resources. Every year, one of the projects I give my students is to figure out how the global community can address the climate risk, given that it requires concerted global action, that some countries cause more emissions per capita than others, that some are endowed with abundant fossil fuel resources, and that some are richer than others. The students must also address the fact that the energy system is complex in that emissions reductions take time as we renew factories, buildings and vehicles, and that costs differ depending on energy forms (fossil fuels, renewables) and energy uses (electricity generation, transportation, buildings). But every year, they produce the same answer: Action must begin immediately, rich countries must go first and poorer, lower emission countries must soon follow, even if tariffs are required to ensure compliance. And given current emission levels, they point out, emissions must be falling now in all sectors of the economy, although this may happen faster in some sectors than others, depending on relative costs of decarbonizing. I also ask the students to address CAPP’s argument that tar sands development doesn’t matter. Since some of the students have studied philosophy, they say this argument is a variation of the “fallacy of composition.” This fallacy involves inferring that, since an individual component on its own is not a problem, then it isn’t part of a problem that exists when all components are added together. What researchers who do this consistently find is that it’s already too late to prevent a two-degree increase because of the inertia in our global energy system, which is 85 per cent based on burning coal, oil and natural gas. We would have to blow up our factories, electricity plants and vehicles to achieve that goal. They also show that, even if we just hope to keep the increase below four degrees, then we can’t allow any expansion of the tar sands, and certainly no new pipelines such as Keystone and Northern Gateway to support any expanded use of fossil fuels. An example is the recent 20-page report from MIT’s Joint Program on the Science and Policy of Global Change, Canada’s Bitumen Industry Under CO2 Constraints (http://globalchange.mit.edu). The report shows how and why the Canadian tar sands must contract immediately as part of a global effort to prevent a four-degree increase in temperature and catastrophic climate change. The Washington Post deserves enormous credit for the editorial on climate change it ran this weekend. There is usually no more reliable barometer of elite conventional opinion than the Post, but in U.S. politics, CW has been running away from climate for the last few years. In this case, the Post is standing up for a plain truth that is almost never spoken in U.S. media: that climate change is a crisis, already upon us, and every bit of delay in responding raises the eventual (and inevitable) costs of doing so. Others will rehearse the Post‘s past journalistic sins on climate — they are many. I choose to hope this marks a new seriousness. RISING SEA levels threaten to inundate low-lying roads in Louisiana, costing billions in port activity, The Post’s Juliet Eilperin reports. Northrop Grumman sees potential damage to billions in shoreline defense infrastructure, such as the imperiled drydock in Hampton Roads built to construct the next generation of aircraft carriers. Other factors are also at work in these examples of rapid coastline loss. But Louisiana and Virginia offer a picture of how further sea-level rise and higher storm surges — just one set of climate-related risks — could seriously disrupt human activity. America, meanwhile, is fixated on . . . paying an extra buck per gallon at the gas pump. A recent report from the Organization for Economic Cooperation and Development (OECD) underscores how myopic the country’s energy debate is — and, consequently, how delinquent the United States has been in leading the world. The organization calculated that the world is on course to increase its carbon emissions by 50 percent by 2050. That’s because global energy use will increase by 80 percent by mid-century, with 85 percent of the energy mix coming from fossil fuels. That would likely raise global temperatures well past the target of 2 degrees Celsius, beyond which scientists say climate change could be extremely dangerous. It would also produce lethal amounts of air pollution, manifested in more heart attacks, asthma and other maladies. “Global warming is not a problem for the future. It is here now, each year emerging with more power, each year closer to assuming its destiny as the most important fact in our politics, economies, and daily lives. That sense of imminence is new. From Bill McKibben’s new introduction in the 2006 edition of his book The End of Nature, originally published in 1989. The world will face a 50 per cent increase in greenhouse gas (GHG) emissions by 2050 without aggressive and effective policy changes, said an OECD expert on Wednesday. Deputy director of the Environment Directorate for the Organisation for Economic Co-operation and Development (OECD), Helen Mountford, told reporters at an on-line media briefing that an OECD assessment of social and economic trends – outlined in its new OECD Environmental Outlook 2050 report – found that atmospheric levels of GHGs could reach nearly 685 parts per million, far above the target level needed to limit global warming to two degrees Celsius. The increase in emissions will be driven by rising emissions from fossil fuel energy sources, whose percentage of the global energy mix will maintain its current level of about 85 per cent. Averting the worst consequences of human-induced climate change is a “great moral issue” on a par with slavery, according to the leading Nasa climate scientist Prof Jim Hansen. He argues that storing up expensive and destructive consequences for society in future is an “injustice of one generation to others”. To conclude, a projection from 1981 for rising temperatures in a major science journal, at a time that the temperature rise was not yet obvious in the observations, has been found to agree well with the observations since then, underestimating the observed trend by about 30%, and easily beating naive predictions of no-change or a linear continuation of trends. It is also a nice example of a statement based on theory that could be falsified and up to now has withstood the test. The “global warming hypothesis” has been developed according to the principles of sound science. According to the Carbon Tracker report, if Exxon burns its current reserves, it would use up more than seven percent of the available atmospheric space between us and the risk of two degrees. BP is just behind, followed by the Russian firm Gazprom, then Chevron, ConocoPhillips and Shell, each of which would fill between three and four percent. Taken together, just these six firms, of the 200 listed in the Carbon Tracker report, would use up more than a quarter of the remaining two-degree budget. Severstal, the Russian mining giant, leads the list of coal companies, followed by firms like BHP Billiton and Peabody. The numbers are simply staggering – this industry, and this industry alone, holds the power to change the physics and chemistry of our planet, and they’re planning to use it. The fight, in the end, is about whether the industry will succeed in its fight to keep its special pollution break alive past the point of climate catastrophe, or whether, in the economists’ parlance, we’ll make them internalize those externalities. To see what was going on, Dr Hansen superimposed the actual curves for each decade from the fifties to the noughties on a normal distribution, which acted as a reference curve. To make all the curves comparable, he expressed the values of the actual deviations as fractions of a standard deviation, and their frequencies as proportions of their total number. As the chart shows, there are two trends. First, the peaks of the data-based curves move right, over time, with respect to the reference curve. In other words, the average temperature is rising. Second, more recent curves are flatter. A flatter curve means a bigger standard deviation and a wider spread of results. If the mean of each curve were the same, such flattening would imply both more cold periods and more hot ones. But because the mean is rising, the effect at the cold end of the curves is diminished, while that at the hot end is enhanced. The upshot is more hot periods of local weather. “There is unequivocal evidence that Earth’s lower atmosphere, ocean, and land surface are warming; sea level is rising; and snow cover, mountain glaciers, and Arctic sea ice are shrinking. 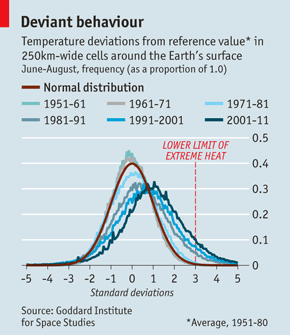 The dominant cause of the warming since the 1950s is human activities. This scientific finding is based on a large and persuasive body of research. The observed warming will be irreversible for many years into the future, and even larger temperature increases will occur as greenhouse gases continue to accumulate in the atmosphere. Avoiding this future warming will require a large and rapid reduction in global greenhouse gas emissions. The ongoing warming will increase risks and stresses to human societies, economies, ecosystems, and wildlife through the 21st century and beyond, making it imperative that society respond to a changing climate. To inform decisions on adaptation and mitigation, it is critical that we improve our understanding of the global climate system and our ability to project future climate through continued and improved monitoring and research. This is especially true for smaller (seasonal and regional) scales and weather and climate extremes, and for important hydroclimatic variables such as precipitation and water availability. Berkeley Earth also has carefully studied issues raised by skeptics, such as possible biases from urban heating, data selection, poor station quality, and data adjustment. We have demonstrated that these do not unduly bias the results. Many of the changes in land-surface temperature can be explained by a combination of volcanoes and a proxy for human greenhouse gas emissions. Solar variation does not seem to impact the temperature trend. A global consensus is emerging that the increase in atmospheric temperature should be limited to around 2°C above pre- industrial levels in order to prevent the worst impacts of climate changes. In order to keep temperatures within this range, the IPCC’s Fourth Assessment Report argues that global greenhouse gas (GHG) emissions must start declining by 2015.2 For industrialized countries, which are responsible for most of the GHGs already in the atmosphere, this implies implementing drastic cuts immediately; the latest IPCC Report suggests that compared to 1990 levels, industrialized countries might have to reduce their emissions by 25 to 40 per cent by 2020 and 80 to 95 per cent by 2050.3 Thus, there is little time left to avoid the worst impacts of climate change—ambitious action is required now. As United Nations Secretary General Ban Ki-moon aptly noted, climate change is “the defining challenge of our age”. United Nations Environment Program (UNEP). 2009. Climate and Trade Policies in a Post-2012 World. “Turn Down the Heat: Why a 4°C Warmer World Must be Avoided,” (pdf) warns we’re on track for a 4°C warmer world marked by extreme heat-waves, declining global food stocks, loss of ecosystems and biodiversity, and life-threatening sea level rise. The effects of climate change are already evident in Europe and the situation is set to get worse, the European Environment Agency has warned. In a report, the agency says the past decade in Europe has been the warmest on record. It adds that the cost of damage caused by extreme weather events is rising, and the continent is set to become more vulnerable in the future. The findings have been published ahead of next week’s UN climate conference. They join a UN Environment Programme report also released on Wednesday showing dangerous growth in the “emissions gap” – the difference between current carbon emission levels and those needed to avert climate change. Using satellite data, scientists reveal ‘definitive’ study that claims sea levels are rising, writes Naomi Seck. (Nanowerk News) New research shows some of the clearest evidence yet of a discernible human influence on atmospheric temperature. Published online in the Nov. 29 early edition of the Proceedings of the U.S. National Academy of Sciences (“Identifying human influences on atmospheric temperature”), the study compared 20 of the latest climate models against 33 years of satellite data. When human factors were included in the models, they followed the pattern of temperature changes observed by satellite. When the same simulations were run without considering human influences, the results were quite different. We perform a multimodel detection and attribution study with climate model simulation output and satellite-based measurements of tropospheric and stratospheric temperature change. We use simulation output from 20 climate models participating in phase 5 of the Coupled Model Intercomparison Project. This multimodel archive provides estimates of the signal pattern in response to combined anthropogenic and natural external forcing (the fingerprint) and the noise of internally generated variability. Using these estimates, we calculate signal-to-noise (S/N) ratios to quantify the strength of the fingerprint in the observations relative to fingerprint strength in natural climate noise. For changes in lower stratospheric temperature between 1979 and 2011, S/N ratios vary from 26 to 36, depending on the choice of observational dataset. In the lower troposphere, the fingerprint strength in observations is smaller, but S/N ratios are still significant at the 1% level or better, and range from three to eight. We find no evidence that these ratios are spuriously inflated by model variability errors. After removing all global mean signals, model fingerprints remain identifiable in 70% of the tests involving tropospheric temperature changes. Despite such agreement in the large-scale features of model and observed geographical patterns of atmospheric temperature change, most models do not replicate the size of the observed changes. On average, the models analyzed underestimate the observed cooling of the lower stratosphere and overestimate the warming of the troposphere. Although the precise causes of such differences are unclear, model biases in lower stratospheric temperature trends are likely to be reduced by more realistic treatment of stratospheric ozone depletion and volcanic aerosol forcing. 350 is a popular number among people concerned about climate change. That is because 350 parts per million (ppm) of carbon-dioxide in the atmosphere is the level that, in the words of James Hansen, a prominent climate scientist, is needed “to preserve a planet similar to the one on which civilization developed and to which life on Earth is adapted”. Today the ratio is nudging 400ppm, the highest since the Pliocene, 4m years ago, when Canada was a tropical jungle. This prompted some, including the UN, to suggest 450ppm, which should limit warming to 2ºC, as a more realistic goal. All the same, 350 has become a rallying cry, especially for the younger generation which will bear the brunt of global warming but as yet lacks the political clout to do much about it. It is also the name of a network launched in 2008 by Bill McKibben, the aim of which is to shift the fight against climate change out of high politics and onto the streets—or at least to places where youngsters hang out. Rather than lobby for change in dysfunctional, and old, Washington, DC, 350 has spent the past five years spreading the word around college campuses, religious organisations and municipal authorities, for instance pressing them to shed stakes in fossil-fuel firms. The outfit does not just argue that such investments are immoral, but also that they are risky (as we wrote last week, if governments were determined to implement their climate policies, a lot of energy firms fossil-fuel reserves, on which their stock valuations hinge, would have to be left in the ground). Such arguments have so far convinced four American colleges and a big church in Australia to dump shares in fossil-fuel-related businesses and to invest in renewable energy instead. At the local-government level, ten American cities, including Seattle, San Francisco and Madison, have committed to similar divestments, persuaded, among other things, by 350’s lobbying. Mr McKibben, a former journalist for the New Yorker and author of “The End of Nature”, published in 1989 and widely regarded as the first book on climate change for a general audience, co-founded the network with seven undergraduate college students. It now counts thousands of volunteer organisers in 188 countries. Perhaps 350’s most famous day of action was October 24th 2009, when it co-ordinated 5,200 separate demonstrations in 181 countries. This was made possible in part thanks to 350’s 132 chapters in 57 countries and helped by its large social-media following: with 138,000 Twitter. In fact, Mr McKibben claims that 350 has now managed to hold rallies in every country on Earth bar North Korea. In June 350 will host 500 young grassroots activists and climate-conscious political leaders at the Global Power Switch conference in Istanbul, to be followed by a slew of smaller, regional summits. The shindig was ten-times oversubscibed, says Mr McKibben. For starters, Obama is aware that we can’t just keep burning oil, coal and gas until they run out. As the International Energy Agency warned, “no more than one-third of proven reserves of fossil fuels can be consumed prior to 2050” — unless carbon capture and storage technology is widely deployed — otherwise we’ll bust through the limit of a 2 degree Celsius rise in average temperature that climate scientists believe will unleash truly disruptive ice melt, sea level rise and weather extremes. The rest has to stay in the ground, and we need to steadily find cleaner alternatives and more energy efficiency. I asked Obama if he agreed with that analysis. Scientists have observed an increase in carbon dioxide’s greenhouse effect at Earth’s surface for the first time. The researchers, led by scientists from the US Department of Energy’s Lawrence Berkeley National Laboratory (Berkeley Lab), measured atmospheric carbon dioxide’s increasing capacity to absorb thermal radiation emitted from Earth’s surface over an 11-year period at two locations in North America. They attributed this upward trend to rising CO2 levels from fossil fuel emissions. The influence of atmospheric CO2 on the balance between incoming energy from the Sun and outgoing heat from Earth (also called the planet’s energy balance) is well established. But this effect has not been experimentally confirmed outside the laboratory until now. The research is reported Feb. 25 in the advance online publication of the journal Nature. The report’s authors say coastal cities from Dubai to Iran’s Bandar Abbas could experience summer days that surpass the “human habitability” limit, with heat and humidity so high that even the healthiest people could not withstand more than a few hours outdoors. Other Middle Eastern cities could approach the lethal threshold, including the Saudi holy city of Mecca, a destination for millions of Muslim pilgrims every year, according to the report in the peer-reviewed journal Nature Climate Change. The first three months of 2016 were the warmest on record in 136 years — by large margins. The massive Greenland ice sheet has melted this spring to an extent that scientists say they’ve never seen this early. New research suggested that if high levels of emissions continue unabated, sea levels could rise by nearly twice as much as expected by the end of this century. A global coral bleaching event fueled by warm seas is turning some once-majestic reefs into ghostly underwater graveyards. She’s right—it would be easier for everyone if it weren’t that simple. Union workers have truly relied on those jobs to build middle-class lives, and all of us burn the damned stuff, all day, every day. But the problem is, it is that simple. We have to “turn away.” We have to “keep it in the ground.” The numbers are the numbers. We literally cannot keep doing what we’re doing if we want to have a planet. “Keeping it in the ground” does not mean stopping all production of fossil fuels instantly. “If you let current fields begin their natural decline,” says Kretzmann, “you’ll be using 50 percent less oil by 2033.” That gives us 17 years, as the wells we’ve already drilled slowly run dry, to replace all that oil with renewable energy. A Regina-based researcher is one of nearly 100 scientists hand-picked from around the world to be part of a new study that shows the planet is indeed getting hotter. David Sauchyn is a senior researcher at the Prairie Adaptation Research Collaborative and professor of geography at the University of Regina. He’s one of a handful of Canadians whose climate research has been used to create an international database of historical temperature records — some going as far back as 2,000 years — so scientists could have a better idea of what the earth’s natural temperature was before humans started burning fossil fuels. The major finding? That the planet’s temperature was declining over the last 2,000 years until 150 years ago when that trend did an about-face, and temperatures started rising rapidly. “It just adds to the large body of scientific facts that confirm, that verify that the climate is warming at an unusual rate,” he said of the study.